Product information "Native Instruments Komplete 9"
The Native Instruments KOMPLETE 9 is a professional collection for production, performance, and sound design – at an unbeatable value. 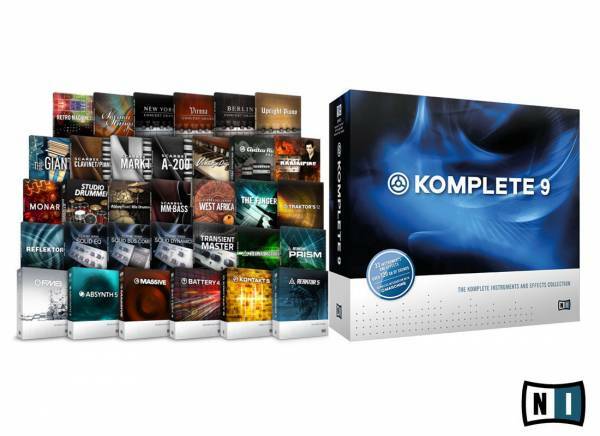 KOMPLETE 9 delivers 33 full-fledged instruments and effects, 12.000 inspiring sounds and over 120 GB of premium samples. Now including MONARK monosynth, BATTERY 4 drum sampler, the enormous sound of THE GIANT, and the ultra-playable SESSION STRINGS. Contains also all-time classics like KONTAKT 5, REAKTOR 5, GUITAR RIG 5 PRO, the mighty MASSIVE, FM8, and ABSYNTH 5. This bundle includes covering instruments and effects for all professional productions. Below is an overview of each product category. The virtual analog powerhouse MONARK joins the bass music heavyweight MASSIVE, the crystalline sound of FM8, the otherworldly sound of ABSYNTH, plus SPARK, PRISM, and a stunning collection of 20 vintage analog synths and keyboards. Professional mixing tools for any production task including the completely updated SOLID MIX SERIES and TRANSIENT MASTER. Also on board are a set of versatile and dynamic effects including THE FINGER, TRAKTOR’S 12, and REFLEKTOR – powerful tools to shape, bend, and morph tracks at will. A completely redesigned BATTERY 4 adds slick, heart-pounding electronic and urban kits to your production arsenal. The ABBEY ROAD DRUMMER Series and STUDIO DRUMMER deliver an inspiring collection of drums for KONTAKT – instruments featuring ultra-detailed mixing options and the pinnacle of studio effects. WEST AFRICA delivers percussion from West Africa including authentic, playable rhythmic phrases. GUITAR RIG 5 PRO is a professional guitar studio, featuring essential amps and effects and Control Room Pro – putting you behind a virtual mixing desk to sculpt your tone to perfection. All this alongside the devastating, signature sound of RAMMFIRE, and legendary basses from the SCARBEE collection of sampled instruments. KOMPLETE 9 includes the larger-than-life sound of THE GIANT and ultra-expressive SESSION STRINGS, along with a pristine selection of classic organs and a legendary cast of perfectly sampled electric, upright and concert grand pianos. 8 GB free disc space / 90 GB* for complete installation, DVD drive. Speci?c requirements vary depending on the individual program. • All products included within a single edition of KOMPLETE 9 are part of one user license and can only be used as a single entity. A maximum of three installations on three machines are allowed as long as only one installation is used at any given time. The individual products cannot be resold separately. • KOMPLETE 9 includes the GUITAR RIG 5 PRO software but not the RIG KONTROL hardware controller. Be the first who writes a review for: "Native Instruments Komplete 9"